Poole, Dorset, August 27, 2018 – Ibcos Computers Ltd., a leading business management software supplier for agricultural, groundcare, and construction dealers, is pleased to announce the launch of its new Gold Service Mobile & Web Application, designed to help dealers make their workshop more efficient and profitable. The new product is both a mobile app and a web browser interface. 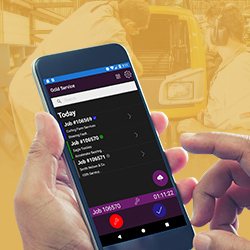 The mobile application, which can be installed on a tablet or a smartphone, allows engineers to log their tasks and hours from any location, at any time, removing the need for a paper job card. This helps them streamline the administrative side of their job and focus on what they are paid for. The web-based portion of Gold Service is aimed more toward those working at the depot. Instead of waiting for an engineer to return with a completed paper job card, the team at the depot can access that data immediately through a web browser. This helps them save time on manual re-keying, allowing them to devote it to proactively engaging their customers. Dealers who would like to know more about Ibcos Gold in general or wish to add the Gold Service app to their existing software package can do so by visiting Ibcos’ website at www.ibcos.co.uk or contacting the Ibcos team at sales@ibcos.co.uk.